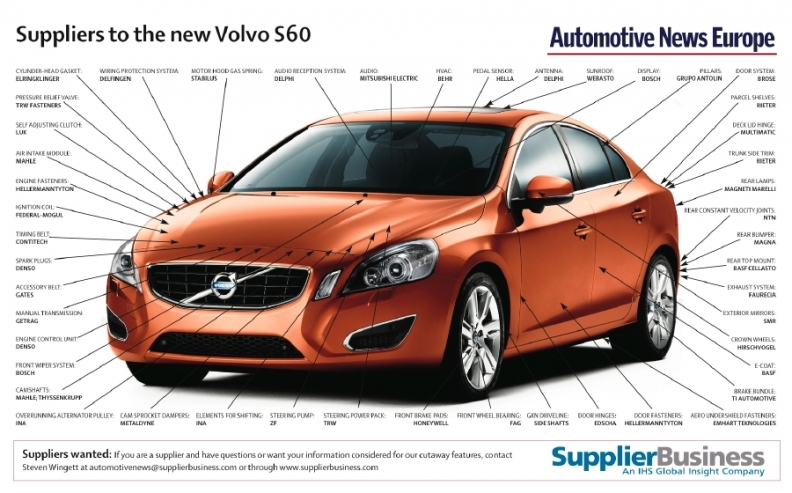 A number of suppliers' technologies help the new Volvo S60 "see" more than ever. The sedan has Samvardhana Motherson Reflectec's Blind Spot Information System (BLIS), which alerts drivers to vehicles in the rear blind spots on both sides of the car. SMR used to be known as Visiocorp Plc and before that it was part of German supplier Schefenacker. Visiocorp's name was changed in 2009 after being acquired by the Samvardhana Motherson Group. Delphi Automotive LLP's Electronically Scanning Radar (ESR), which is integrated into the S60's grille, is a key part of the car's optional pedestrian detection and automatic braking system. The ESR scans for pedestrians in the road or who may step into the vehicle's path. If objects are in front of the car the system can help prevent pedestrian collisions at speeds of up to 21 mph (34kph). Germany's Getrag Group and Sweden's Haldex AB improve vehicle stability by supplying the all-wheel-drive system. Getrag produces the rear drive module and the power take off unit while Haldex provides the coupling and developed the vehicle dynamics software. Volvo builds the S60 in Ghent, Belgium. The initial annual global sales target is 90,000 units with the five largest markets being the UK, the United States, China, Russia and Sweden. Volvo unveiled the new sedan at the Geneva auto show in March 2010. The BMW 5-series rival is available with a choice of two diesels or a gasoline engine. In 2011, Volvo will add a third diesel that has a CO2-output rating of 115 grams per kilometer.